A plane bound for the infamous Lukla airport in Nepal crashed yesterday, killing all 19 people on board. It is believed that the aircraft struck a bird shortly after takeoff from Kathmandu, resulting in the crash minutes later. This is the sixth such accident in the past two years, calling into question the level of air safety in the country. The plane, operated by Sita Air, set off with 16 passengers and three crewmembers for the Tenzing-Hillary Airport in Lukla, which is the starting point for trekkers hiking to Everest Base Camp. Shortly after departure, the air traffic controllers noticed an erratic maneuver by the aircraft and when contacted by radio the pilot indicated that they had struck a vulture. 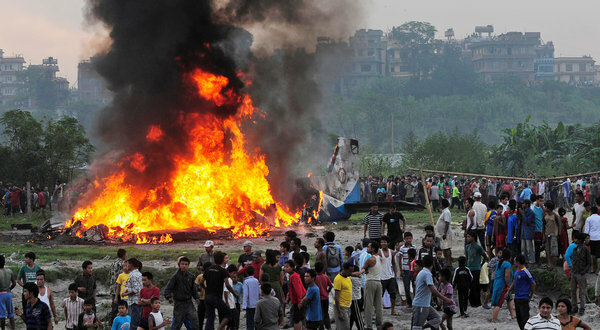 The plane was attempting to safely return to Kathmandu when it went down. Reports indicate that there were seven passengers aboard from both the U.K. and Nepal, while the other five people were Chinese nationals. Most were there on holiday and were preparing to trek in the Himalaya Mountains. Over the past two years, 120 people have been killed in similar accidents throughout the region. Most were either on their way to or from the airport in Lukla at the time. According to the BBC, Nepalese Prime Minister Baburam Bhattarai has vowed to improve safety and prevent similar accidents from happening in the future, although he has not outlined exactly how he intends to improve safety just yet. Having made that same flight a few years back, I can tell you that it is a beautiful journey into the mountains, but most of the planes look like they’ve seen their better days. At the height of the trekking season, which is just getting underway now, aircraft are constantly in and out of Lukla. That means that there are dozens of similar flights all day long, weather permitting. Hopefully the Nepalese government will introduce a more stringent maintenance and inspection process to prevent similar problems in the future.